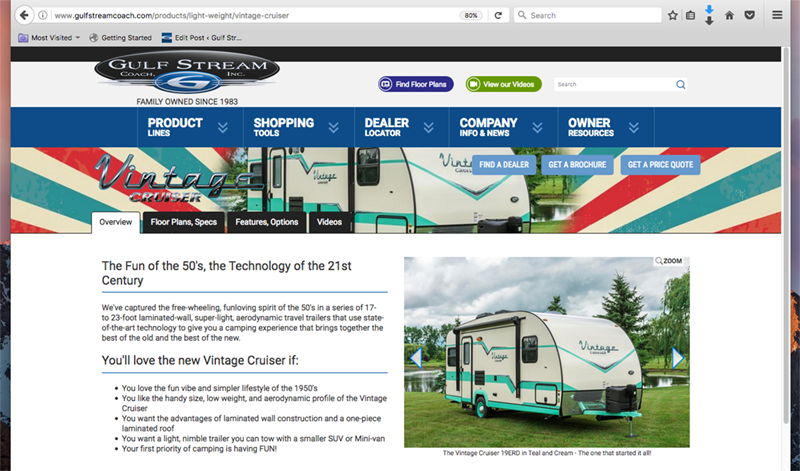 If you’re like lots of people in the RV world, you’re excited about the new Gulf Stream Coach Vintage Cruiser lightweight travel trailers. it’s easy to see why! Vintage Cruisers capture the colors, styles, spirit, and fun vibe of the 1950’s in trailers that feature all the latest high-tech features we need and want. But if you’re looking for pictures, comments, and posts from actual Vintage Cruiser owners, pay a visit to “The Vintage Cruisers” group on Facebook. There you’ll find hundreds of current Vintage Cruiser owners, (and many Vintage Cruiser fans) who have posted pictures of their camping experiences. You will see some of the great decorating touches owners have added, and suggestions for storage, entertainment, and FUN! After all, FUN is the key “standard feature” of the Vintage Cruiser. Just pull into any campsite and you’ll see the reaction of other campers. It’s an instant icebreaker, conversation-starter, and friend-maker. That’s a lot like The Vintage Cruisers Facebook group. Feel free to pay a visit – and join up, if you like! This entry was posted in News on May 30, 2017 by pcampbell@gulfstreamcoach.com. If you’re like many people, you love the chance to explore RV floor plans through pictures and videos. 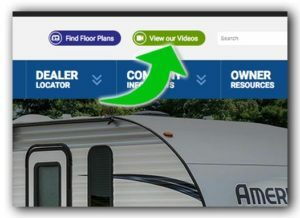 That’s why we we’re excited to announce that we’ve flooded the Gulf Stream Coach Web site with 57 new walk-through videos to help you find the RV that’s right for you! Each walk-through video offers you a quick but thorough tour through one of our travel trailer, motor home, or toy hauler interiors. In each video you get an in-person look at the living area, kitchen, bedrooms, baths, and other features. All the walk-throughs are just 1 to 2 minutes long, and all are presented without the distraction of a salesperson’s sales pitch. Where are the walk-through videos? There’s a “View Our Videos” button at the top of every page that will take you to the whole library, ordered by brand. There is also a “Videos” choice in the “Shopping Tools” drop-down on every page. If you’re on specific brand or model pages on the site, you’ll find a “Videos” tab near the top of the page that will show you all the videos for that particular brand. 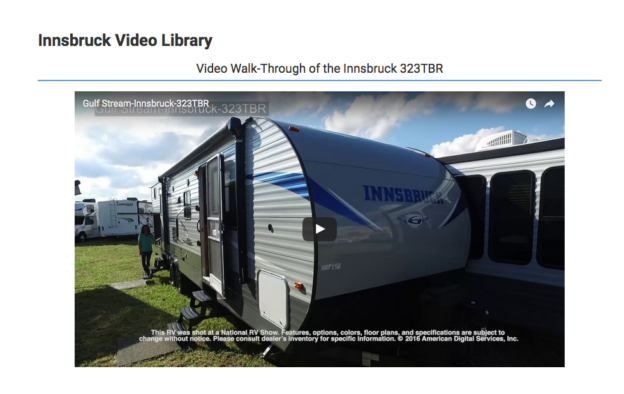 Either way, anywhere on the Gulf Stream Coach site, you’re just a click or two away from scores of walk-through videos that can help you see features, explore different layouts, and narrow down your favorites. And while we have 57 walk-through product videos online already, the video library still isn’t complete, so expect to see videos updated and added as time goes by. 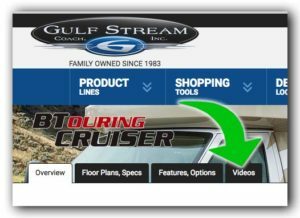 When added to other shopping tools, like floor plan diagrams, photo galleries, specifications, feature lists, and our “get a price” tool, our new walk-through videos give you powerful ways to find the Gulf Stream Coach product that’s ideal for you and your family! This entry was posted in News on May 9, 2017 by pcampbell@gulfstreamcoach.com. The Quality Circle Award – A measure of distinction. All RVs are not created equal – Thank goodness for that! – The variations give owners a huge range of floor plans, features, specifications, and prices. RVDA uses a secret ballot to choose Quality Circle Award winners. The Quality Circle Award is given to RV Manufacturers based on votes by RV dealers across the US and Canada. It’s like the “Academy Award” of the RV industry! 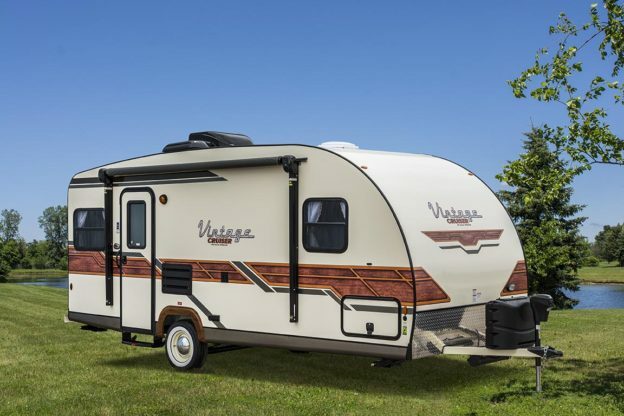 The award is earned by a very small fraction of the RVs on the market, based on survey results from RV Dealers measuring product quality, warranty and service support, and overall Dealer satisfaction. It should come as no surprise that Gulf Stream Coach is a multiple-award, multiple-year winner, with many of its popular brands heralded for quality, support, and satisfaction. After all, being responsive and responsible to our dealers and retail customers is the foundation of our way of doing business. Because we’re family-owned and family-focused, we don’t spend time or money satisfying the demands of a corporate board of directors or stockholders. We spend time and money pleasing YOU. Our award-winning focus on families has a 30-year heritage. Our family focus has proven itself in the business world with over 30 years of success fulfilling the needs of hundreds of valuable dealers, and making dreams come true for hundreds of thousands of camping families – And we have the Quality Circle Awards to prove it! This entry was posted in News and tagged Gulf Stream Coach, Quality Circle Award, Recreation Vehicle Dealers Association, RVDA on May 3, 2017 by pcampbell@gulfstreamcoach.com.